National Gaelic Debate Winners 2011 – By now everyone should have heard about the success of Ceitidh Alice and Anna Hulme in the Scottish Parliament final of the National Gaelic Debate. Click here for their report of the event. Duke of Edinburgh Award – Callum Vickerstaff, Gemma Urquhart, David Robertson and former pupil Jake Bulmer have achieved Silver. Chris Young and Rebecca Dreisbach-Pollington have each achieved Bronze. Well done to all. S5/6 Prelims – Pupils in S5/6 have been working with their teachers preparing and planning for their exams which start at the end of January. They have been given appropriate materials for their subjects and advised about the steps they need to take to achieve their best grades. The booklet ‘Information and Study Advice for Pupils and Parents’ was issued prior to Prelims in S4 and remains relevant to these exams. It is also available on the school website. We would ask that parents support pupils in preparation for these important exams. Farewell – Yvonne Spence received a thank you from staff and pupils this week for her contribution to school life over the last few years. Since moving to Gairloch, Yvonne has supported the school in many ways. She was an active member of the Parent Council helping in a large number of events, fighting over staff cuts in the school and raising funds along the way (e.g. the burger stand at the Gathering). Recently she has been helping develop the cooking skills of pupils taking part in the Duke of Edinburgh’s Award scheme. We will miss Yvonne but we wish her well in her next family venture! Enquire – The Scottish Advice Service for Additional Support Needs is the national advice service for additional support for learning. The service is funded by the Scottish Government and managed by Children in Scotland. Enquire helps children, young people, families and professionals understand their rights and responsibilities under the Education (Additional Support for Learning) (Scotland) Act 2004 and related legislation. Enquire operates a helpline that you can call or email if you require advice or information about any aspect of additional support for learning. The service is confidential. A range of easy to read guides and factsheets explaining everything from additional support in the early years to transition can be downloaded from their website. 2012 GHS Calendar – The calendar (displaying pupil art work) is still available from the school office and local shops. Cost £5 and all proceeds go to school funds. 9th January 2012 – School opens for all! Christmas – As I write this (9th December) S2 pupils are putting the final preparations into the Christmas play A Christmas Carol. Everyone is also preparing for the Dance. We also say farewell this weekend (December 18th) to our Malawian guests. 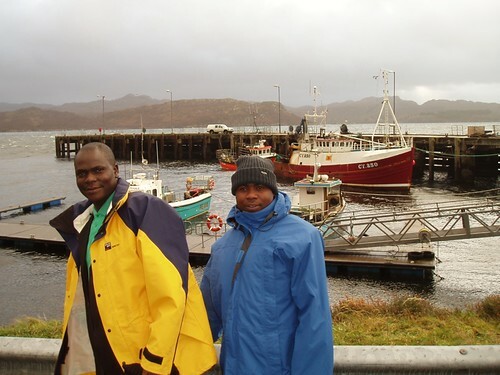 Mr. Chibwera and Mr. Maseko have had a very busy time in Gairloch taking part in classes, playing football, meeting parents and visiting local estates. They met with Primary children, played basketball, learned some Scottish dances and planned for future projects between our two schools. They experienced weather like they have never encountered and will fly home this weekend with a large amount of Highland goodwill in their pockets. Thank you to everyone in the community who contributed to making their visit a successful, productive and friendly affair. A special thanks to Dr Caley and Mr. Hulme for their help in planning and executing the successful visit. Information and photographs of many school activities can be seen on the website. Merry Christmas and a Happy New Year to everyone from all at Gairloch High School! 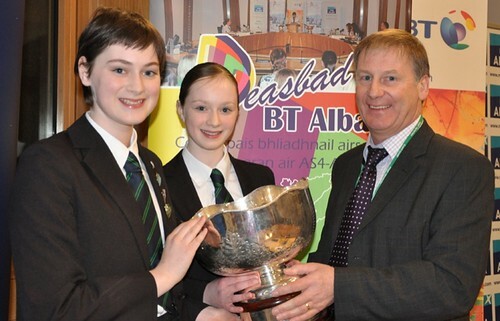 An Deasbad Nàiseanta Gàidhlig – Click on the photo to read about the success of sisters Anna and Ceitidh Alice Hulme in the 2011 Scottish Schools National Gaelic Debating competition. Charity Fund Raising– S6 raised £350 for Children in Need recently by organising a cake sale followed by the chance for pupils to throw wet sponges at some of the teachers! Previous to this event around £85 was raised for Poppy Scotland. Eilidh Owens (S3) raised an additional £78 by doing a sponsored walk through her home village of Lochcarron. Well done to all the pupils (and staff) involved in these events. Pupil Success – Well done to Kirsty Alexander (S6). After a week on the Isle of Coll she has been successfully selected for a Project Trust placement. Kirsty now has to fund raise with the intention of going to India next year. Well done to Megan Crueize, Sofie Banister and Fraser Hinchliff for coming 1st, 2nd and 3rd respectively in the 12-18 category of Two Lochs Radio’s 106 Words writing competition. Rebecca Griggs, Freya Baptist and Oscar Howard all took part in the Highland Youth Regional Music Group Aviemore Concerts on the 19th November. An exciting event for all! Read more about the music groups and see lots of photos by clicking here. Louie O’Brien (S1) performed very well recently in the U13 Highland Badminton Championship. He competed in several categories and is clearly one to watch for the future! 2012 GHS Calendar – The new full colour calendar is now available from the school office – cost £5. There is a copy on display outside the library. All proceeds go to school funds! Calum’s Road – Culture Club travelled to The Craigmonie Centre in Drumnadrochit to see the stage version of ‘Calum’s Road‘ by the National Theatre and a company called Communicado. The play was set in Raasay and was popularised by a recent book of the same name. The performance was tremendous and the use of staging, props and back projection very effective. The story was inspiring, with a ring of truth and poignancy for any small, rural community. Our next intention is to see Scottish Ballet perform Sleeping Beauty in January. That should be popular. Future Chef Competition – Eight pupils (S2 to S5) entered the School Heat of the Future Chef competition. They had one hour to prepare and cook a hot main course for 2 people within a budget of £4. The meals had to be plated up, ready to eat. Thanks to Susan Kirkness who kindly came to blind judge the dishes. Susan’s daughter Rosie (a previous Future Chef success) is now training with Michel Roux Jr in London. FilmG – Air Dimàirt 1 den t-Samhainn, ghabh sgoilearan aig a bheil Gàidhlig ann an S2 – S4 pàirt ann am FilmG – co-fharpaisean Gàidhlig filmichean goirid. ’S e cuspair na co-fharpais am-bliadhna “Air an Stairsich”. Bha aig a’ bhuidheann againn ri sgriopt a chruthachadh, caractaran a chur air dòigh, uidheaman a lorg, filmeadh agus gearradh – le beagan cuideachaidh air a thoirt dhuinn. Am-bliadhna, rinn sinn film mu bhalach aig a bheil gràin air an sgoil, obair-dachaigh, tidsearan agus mar sin air adhart. Tha e air a thoirt air ais ann an tìm dha na 1940an agus tha e a’ gabhail uabhas nuair a tha e a’ faicinn mar a bha an sgoil an uair sin. Tha e a’ faighinn an srac agus tha e a’ dol air ais dha na 1900an agus a’ faicinn mar a bha beatha mus robh sgoil ann. Tha e a’ coinneachadh ri a shinn-sheanair air a’ chroit mus tèid e air ais dhan linn fhèin (2011) far a bheil e a’ faicinn cho math ’s cho furasta ‘s a tha a bheatha. Aig an deireadh, tha a character air atharrachadh gu tur. On 1st of November S2–S4 Gaelic speaking pupils took part in a Gaelic short film competition. The theme of the competition this year was “On the Threshold”. Our group had to create a script, a cast, find props, film and then edit the production with some outside help. U14 Boys Highland Regional Basketball Development League – Played on Saturday 19th November. Played 3, won 3 – a great start to the league! The win against the Bears “A” team raised lots of eyebrows! On 22nd November the U14 teams played against Fortrose Academy in the Schools’ Cup. Well done to all boys and girls attending training and playing for their school. Car Wash Fundraising Event – A car wash will be held at the High School car park between 10am and 2pm on Saturday 10th December to coincide with the Christmas Market in the Community Hall. The cost per car will be £3. Please support this enterprising event by the pupils.